CNN hosts a marathon night of town halls for five 2020 Democratic presidential candidates including Elizabeth Warren, Amy Klobuchar and Pete Buttigieg. Trevor chats between segments about "no collusion" vs. "no obstruction" and how the Mueller report is forcing Trump to learn things about the criminal justice system that black Americans are all too familiar with. The Mueller report is finally released to the public, proving not to be as vindicating for Trump as Attorney General William Barr initially claimed. Nine years ago tomorrow—April 20, 2010—crude oil began leaking from the Deepwater Horizon drilling rig into the Gulf of Mexico in what turned out to be the largest marine oil spill in history. A long-term study suggests the oil is still affecting the salt marshes of the Gulf Coast, and reveals the key role that marsh grasses play in the overall recovery of these important coastal wetlands. Conducting the study was a multi-institutional research team funded in part by the Gulf of Mexico Research Initiative, a 10-year independent program established through a $500 million financial commitment from BP. The team began sampling soon after the spill was finally contained, and continue their work today. Their most-recent article—in Estuaries and Coasts—reports on the first six and a half years of sampling post-spill. Lead author on the study is John Fleeger, an emeritus professor at LSU. Co-authors are Rita Riggio, Irving Mendelssohn, Qianxin Lin, and Aixin Hou of LSU; David Johnson of William & Mary's Virginia Institute of Marine Science; Donald Deis of Atkins North America; Kevin Carman of the University of Nevada-Reno; Sean Graham of Nicholls State University; and Scott Zengel of Research Planning, Inc.
Johnson, an assistant professor at VIMS and expert in salt marsh invertebrates, says "Our study highlights the crucial role that plants play in the recovery of important links in the Gulf of Mexico's coastal food web." Those links ultimately connect to the fish and shellfish that support the region's economy and culture. Two plants dominate healthy Gulf Coast salt marshes—the smooth cordgrass Spartina alterniflora and the black needlerush Juncus roemerianus. Also abundant on the marsh surface are single-celled, plant-like organisms that scientists collectively refer to as benthic microalgae, while a suite of small invertebrates—amphipods, copepods, nematodes, snails, worms, and others—swim, hop, and crawl among the grass blades or burrow in the underlying root zone. The team studied these organisms by measuring their abundance and biomass in heavily oiled, moderately oiled, and oil-free areas of Louisiana's Barataria Bay, using both surface plots and shallow cores. Sampling took place at roughly 6-month intervals between 2011 and 2016. 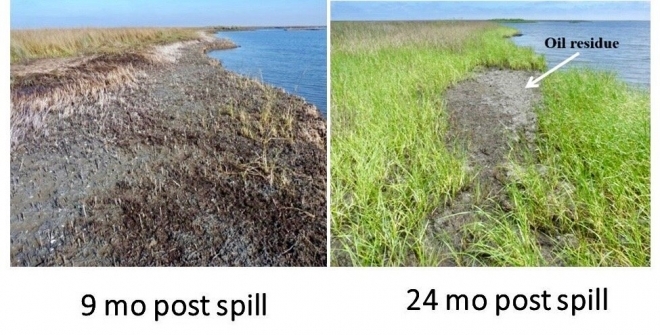 Photos of a heavily oiled saltmarsh in Louisiana's Barataria Bay show recovery of the plant community following the Deepwater Horizon oil spill. Credit: Dr. Qianxin Lin. Following the release of the Mueller Report, John Oliver discusses what we’ve learned. Just four days before the ninth anniversary of the catastrophic BP Deepwater Horizon explosion and oil spill, state coastal officials outlined how they are using the disaster’s silver lining – billions of dollars in fines and other payments – to rebuild 5.1 square miles of the state’s eroding coastline. About $510 million paid by BP and its partners for their roles involving BP’s failed Macondo well in the Gulf of Mexico already has been used to complete restoration work on seven major projects, Greg Gandy, deputy executive director of the Coastal Protection and Restoration Authority, told authority board members on Wednesday (April 17). And another $6.8 billion will be used on dozens of other projects through 2032, the deadline for the companies to pay money owed under various court settlement agreements. Criminal penalties totaling $1.272 billion, overseen by the National Fish and Wildlife Foundation, must be used for either rebuilding barrier islands or the construction and design of major sediment diversions on the Mississippi River by the terms of the criminal settlements with BP and Transocean. The wetland area in the photo was created as part of the Lake Hermitage Phase 2 marsh creation project in Plaquemines Parish, paid for with $14.2 million of Natural Resource Damage Assessment money from BP in the aftermath of the Deepwater Horizon accident and oil spill. (CNN)Even as the Trump administration has taken steps to expand offshore oil drilling, a new report shows that thousands of oil spills are still happening and that workers in the oil and gas industry are still dying on the job. The report comes from Oceana, a nonpartisan nonprofit dedicated to protecting and restoring the oceans, which has sued the federal government to stop seismic airgun blasting in the Atlantic Ocean. The blasting is the first step needed to allow offshore drilling, when seismic airguns are used to find oil and gas deep under the ocean. Every state along the Atlantic coast has opposed the blasting, worried that spills could hurt tourism and local fisheries. Some scientists say the testing could also hurt marine life, including the highly endangered North Atlantic right whale. The group tied its report, released Thursday, to the ninth anniversary of the BP Deepwater Horizon oil spill to show what has been happening since the government promised to hold the industry accountable to higher safety standards. That 2010 spill was one of the worst in US history, killing 11 people and dumping more than 210 million gallons of oil into the ocean, polluting over 1,300 miles of shoreline, killing wildlife and hurting human health. In the lawsuit that followed, a federal judge said the companies involved in the spill were "grossly negligent" in the runup to the disaster. Using public records and interviews with people in the field, Oceana found that although there hasn't been another big blowout like the Deepwater accident, oil spills continue, and so do fatalities, though they're not often front-page news. I scream, you scream, we all scream for Tribeca Film Festival founder Robert De Niro. Who is the greatest actor Tribeca Film Festival founder Robert De Niro ever worked with? Stephen recreates a new, peculiar pro-Trump Facebook ad that aims to target and manipulate senior citizens. Stephen pays tribute to longtime Colbert Report and Late Show cameraman, John Meiklejohn. Thank you, Paul Simon, for delightful musical moments like these. And thank you Trevor Noah, Robert De Niro, Samantha Bee and Molly Shannon for another incredible week at The Late Show. The press secretary is now lying about lies. Press secretary Sarah Sanders was caught lying several times in special counsel Robert Mueller’s report, and now she’s defending herself with more misdirections. During a string of media appearances following the release of the Mueller report on Thursday, Sanders has faced questions about a claim she made during a May 2017 press briefing that she later admitted was false during testimony to Mueller’s team. In an attempt to justify President Donald Trump’s decision to fire then FBI director James Comey, Sanders told reporters that “countless members of the FBI” had contacted her to say they had lost confidence in Comey, when in fact that wasn’t the case. On Thursday evening and Friday morning, Sanders repeatedly downplayed that lie as a mere “slip of the tongue.” But as ABC’s George Stephanopoulos pointed out to her in an interview on Friday morning, she used the line about “countless members of the FBI” multiple times in the days following Comey’s firing — a revelation undercutting her claim that she merely misspoke. Sanders, however, refused to own it, and bizarrely blamed her lie on Democrats.